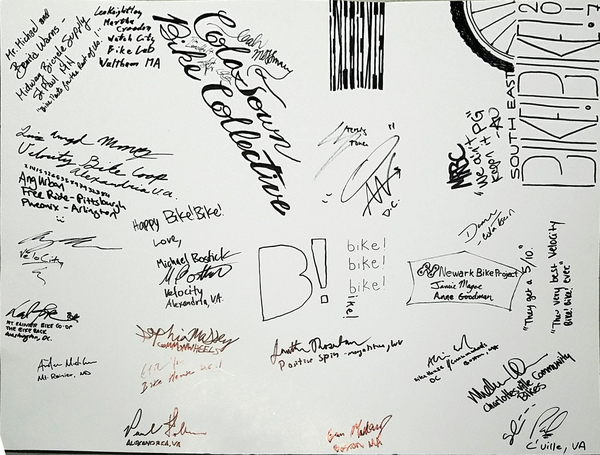 VéloCity wants to give a big thank you to everyone who was a part of Bike!Bike! Southeast 2017! We had over 40 attendees, provided housing for 9, fed everyone all weekend, held 10+ workshops, and joined the Rolling Resistance WTF Alley Cat in DC. Community cycling advocates from around the country came to our space for learning, networking, and a fun on bikes. Over the course of the past year, we raised well more than we spent on the event. All funds raised over our expenditures will support VéloCity Summer programming. Sterling Stone of Gearin’ Up Bicycles gets a special thank you. He was a big part of the planning committee and allowed us to host an afternoon at his shop. We can’t wait until Bike!Bike! Southeast 2018 at Colatown Bike Collective in Columbia, SC!